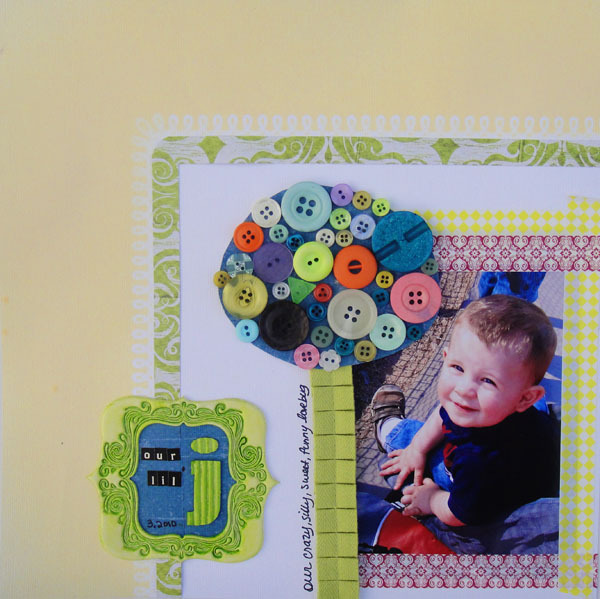 Here are the rest of the layouts from the Color Me Daisy Spring Fever kit. So far I have done 5 layouts, 3 cards and 3 altered projects from the kit and I still have a lot more to work with. I wasn’t sure how much I could make the kit work since when I put the kit together I thought it might be a bit to girly for a mama of two boys. I found enough to use for the boy layouts but it also gave me a reason to scrap some pictures from my binders that I never got to before. This one is probably tied for 1st in my favorite layouts from the kit. 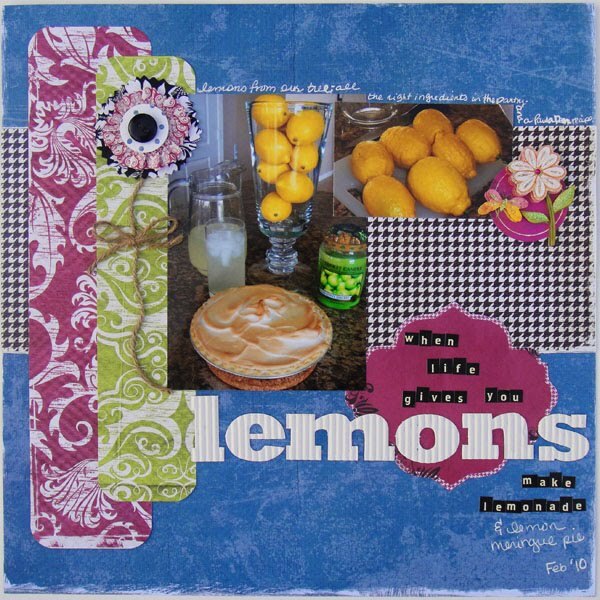 The colors make the lemons stand out and I just love the randomness of life in the story behind it. The story was something I blogged about here. This LO was based on a sketch I had printed out a week or two ago, I believe from The Scrappiest. I just love this picture I took of Jackson recently. I wanted it to be the focus of my page. I like how the button tree adds a lot of color but I think the picture still takes center stage. And I cannot tell you how much I love the Pink Paislee Artisan Element Frames and Tapes. 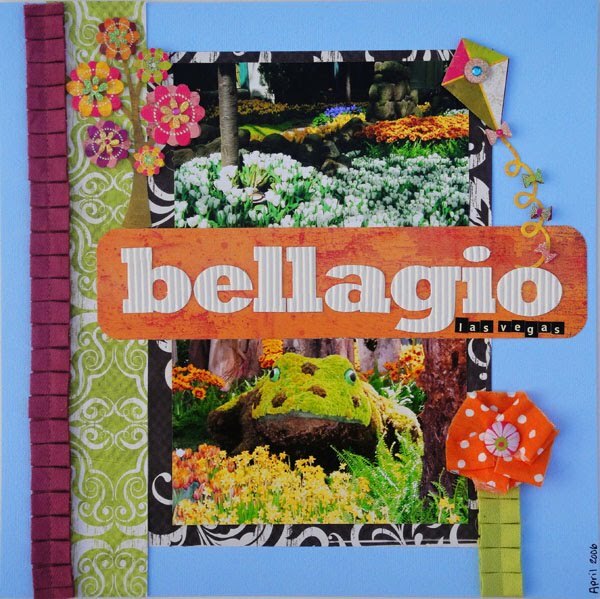 Both are used on this page, along with a feature of my misting and border punch obsession. Before the boys were born, the dogs were featured in a lot more layouts. 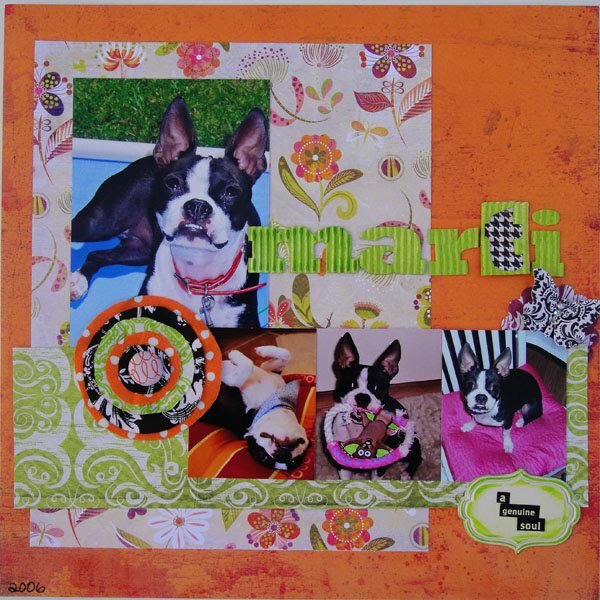 Since they are girly girl dogs there was plenty to work with in this kit for a princess puppy page. I love the Jillibean Alpha’s, the white ones especially give you so many options in altering them. And the fabric in this kit is probably my favorite “evah”! The fabric circle flower was part of a What to Do Fabric Idea Feature in the Color Me Daisy April Kit Idea Guide. This layout was based on a sketch from Inspired Blueprints a sketch site I recently discovered with great sketches and a friendly community. I have had these pictures in my binders for a few years now from a trip to Las Vegas in 2006, the colors in the kit were so perfect for the bright colorful flower gardens of the Bellagio Hotel. I made a fabric strip flower for this one, which was also included in our idea guide. I still have tons of photos of the gardens from that trip, maybe I’ll use up my kit scraps for a mini album. Well that’s it for tonight. 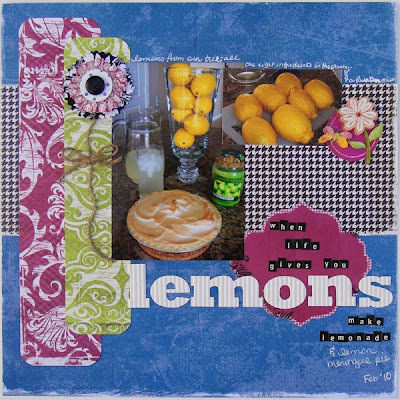 I still have cards, altered projects and a from my scraps project to share over the next couple of days. Cute stuff Michelle!!! I LOVE that one of the lemons too. SO cute. Fabulous layouts! I LOVE all the amazing colors in this bright happy kit.